This blog is starting to look like an online diary. Ok, lest I forget what I did to end the year 2005. Had lunch with my former grade school science teacher and her family at her house with some other Uneans from way way back. Then, off to visit my brother's buddy at Blacktown. Chatted and ate (again) till late afternoon. From Blacktown to Chatswood to have NYE dinner with my parents' classmates. Didn't stay too long, as we have to drive to Pyrmont for the midnight fireworks. It's another 12 hours on the road back to Sydney. The only thing worth mentioning is our stop at Gundagai. There's a famous local landmark called the Dog on the Tuckerbox, which features well, a dog on a tuckerbox. Its origin goes all the way back to the days of the early pioneers in the Australian bush. In 1824, the trail around the Murrumbidgee River was opened up for prospectors and cattle drovers. Times were hard and hazardous, with all supplies having to be manhandled by bullock carts along the makeshift track. Each wagon would usually be accompanied by a dog, who guards his owner's tuckerbox. To pass the time during rest periods, "bullockies" would make up doggerel verse and rhymes, telling stories of their exploits. Rumour has it that the legend of the tuckerbox was born in 1850, on a river creek north of Gundagai. One particular story tells of the hardships of Billy the Bullocky - getting bogged down at nine mile creek, Nobby breaking the yoke, generally getting fed up. To make things worse, his trusty dog sat on the tuckerbox, ruining his meal for the night. Another version says the dog on the tuckerbox is meant to represent the dog's loyalty and trustworthiness in guarding his master's possessions. Below is the original version of the story. It was later amended and made into a poem by Jack Moses. In 1937, Jack O'Hagen's popular song about it immortalized the Dog on the Tuckerbox. During the 12-hour trip, I also managed to finish reading William Goldman's The Princess Bride. It's easy to see why the book is a cult classic. Believable characters, fast-moving plot, a smorgasboard of action, adventure, drama, romance, comedy, tragedy etc. - storytelling at its best. The blurb goes, "Fencing. Fighting. Torture. Poison. True love. Hate. Revenge. Giants. Hunters. Bad men. Good men. Beautifulest ladies. Snakes. Spiders. Beasts of all natures and descriptions. Pain. Death. Brave men. Coward men. Strongest men. Chases. Escapes. Lies. Truths. Passion. Miracles." The book purports to be an abridgment done by Goldman of an older version written by S. Morgenstern. I was lucky enough to have the 25th anniversary edition, which comes with Chapter 1 of the sequel called Buttercup's Baby. I don't believe the sequel was ever published. The book is about the haughty but beautiful Buttercup, who fell in love with farm boy Westley, whom she keeps on bossing around. Westley goes off to America to make his fortune, but was killed by the dreaded Dread Pirate Roberts. Buttercup died (inside) that day, and was later selected to marry Prince Humperdinck. Weeks before the wedding, Princess Buttercup was kidnapped by the Sicilian Vizzini, the Spaniard Inigo Montoya, and the giant Fezzik. The plan was to kill her and dump her body on the Guilder frontier, thus giving Prince Humperdinck an excuse to mount an attack. A man in black gave chase through the Florin Channel and up the Cliffs of Insanity. He bested Inigo Montoya in swordplay, Fezzik in a battle of strength, and Vizzini in a game of wits to finally rescue Princess Buttercup. The man in black turns out to be the Dread Pirate Roberts, who turned out to be the missing Westley. (Long story.) The book then goes into how they dropped into a ravine, how they traversed the Fire Swamp, how they escaped the Lightning Sand, how they fought off the R.O.U.S. (Rodents of Unusual Size), and how they ended up in Prince Humperdinck's clutches. Buttercup gave herself up on the condition that Westley be freed. Unknown to her, Westley was brought to the Zoo of Death, where the Count Rugen tries out his toys of torture on him, especially The Machine. On a particularly bad day where Buttercup found out that Humperdinck never sent ships to look for Westley, the Prince charged down to the Pit of Despair and activated The Machine on maximum, which ultimately killed Westley. Yes, he died - but not for long. Fezzik and Inigo Montoya rescued him from the Zoo of Death and brought him to the miracle man Miracle Max, who brought him back to life for 65 dollars. Off they went to storm Humperdinck's castle. Westley rescues Buttercup from her husband-to-be. Inigo Montoya kills the six-fingered Count Rugen (who killed his father) in a bloody duel. Fezzik finds them four steeds to take them to safety. And they lived happily ever after. The End. Today being another holiday, our breakfast consisted of bland bread and silly cereals. This morning, we're supposed to go to Sovereign Hill. We first dropped by the Gold Museum across the road, while waiting for it to open. The Gold Museum gives quite a comprehensive history of the gold rush in Ballarat during the 1850s. The place is packed with replicas of gold nuggets, mining equipment, and interactive displays showing how mining is done. There's a souvenir shop selling gold trinkets (what else), which made the girls quite happy. The tour guide wasn't so happy because a few of them were late in getting back to the bus. Right outside the Gold Museum is a sculpture of Sir Henry Bolte. At Sovereign Hill, you're transported back to 1850s Ballarat. The 25-hectare Sovereign Hill has about 60 building spread over the recreated goldfields township. There's a main road with quaint little shops on each side of the road. The shops are real and manned by costumed staff. You can walk in any shop and make your purchases. Other volunteers in period costumes walk around, so don't be shy to take pictures with them. (What a job!) Feel free to hop on horse-drawn carriages passing by, but don't forget to pay your fare. Our designated guide walked us through some huge steam machinery, then to the underground mines. The place is dark and cool, and the air is thin. The guide showed us where the gold deposits are, how the miners communicate with the people above, etc. We also watched a multimedia show depicting life in the mines. After the tour, everybody rushed to the Red Hill Gully Diggings to pan for gold. Everyone was so serious in shovelling up the sediments and sifting through them in shallow pans, in hopes of finding real gold. I was skeptical; I mean, all the gold must've been sucked out by done. Only after reading the park brochure did I learn that $30,000 worth of real gold is put into the creek every year for people to "discover." Chanced upon a Redcoat soldier giving a musket firing demonstration. Somewhere in the park is a gold smelting demonstration, where a $50,000 pure gold ingot is poured. Too bad we ran out of time. Twelve Apostles is a few hours' drive away, so we had to leave early. Is it worth the $32.50 entrance fee? I don't think so. My colleague advised me to sit on the left side of the bus when we're driving along the Great Ocean Road. Sit on the right, and you won't see a thing. Well, we're on our way to the Twelve Apostles, I'm staring out the windows, but all I see are trees. Later on the trees started thinning and the ocean came into view. A few minutes later, we're parked at the grounds of Port Campbell National Park. Huh?! Where did the hours of Great Ocean Drive go?! We must've taken a different route or something. Anyway, we crossed a tunnel to the viewing platforms and we see the majestic Twelve Apostles. It's now a misnomer because a couple of the Apostles broke down and plunged into the Southern Ocean. One of them crumbled just last year. For the geology-inclined readers, the Apostles were originally part of the cliffs behind them millions of years ago. Through years and years of waves and wind, the soft limestone started to wear away, leaving caves in the cliffs. As the sea retreated, the caves became archways, and when they eventually collapsed, the rock islands isolated from the main cliffs became known as the Twelve Apostles. We didn't stay too long because the kissing flies were out in full force. The sun was at maximum brightness and coupled with reflections from the water, my pictures appear washed out. It's still an impressive sight though. Today is the official start of the Melbourne tour. After a bland breakfast at the hotel consisting of toast and jam and cereals (today being a holiday), the coach brought us to the Parliament House. Everyone spilled out of the bus and started taking pictures. Designed by Peter Kerr and J.G.Knight, the buildings were constructed at the height of the gold rush. Parliament of Victoria officially opened in 1856, and so will be celebrating it's 150th anniversary next year. Further to the right of the Parliament House is the Princess Theater, which dates all the way back to 1886. On our way to St. Patrick's Cathedral, I noticed the upside-down statue of La Trobe in Gordon Reserve, which took me by surprise. (Charles Joseph La Trobe was the first lieutenant-governor of the colony of Victoria.) I didn't notice this the last time I was in Melbourne, so it must have been a new installment. After some research, I found out that the contemporary art piece was created by artist Charles Robb and unveiled around October. It looks like a typical 19th-century bronze sculpture, but is actually made of plastic and fibreglass. Mr Robb said the inversion of La Trobe questioned the purpose of public monuments and their meaning in contemporary society. Uh-huh. St. Patrick's Cathedral is another great place to take pictures. It must be Melbourne's answer to Sydney's St. Mary's Cathedral. Designed by William Wardell in the Gothic Revival style, St Patrick's is regarded internationally as the finest ecclesiastical building in Australia. Construction started in 1858 and took 82 years to complete. Too bad there's mass going on - I would've liked to take a picture of its organ for my Bavarian friend. Next stop is Cook's Cottage in Fitzroy Gardens. For those who don't know, Captain James Cook is the discoverer of Australia. The original Cook's Cottage was built by Captain Cook's parents in 1755 in in Great Ayton, Yorkshire, England. There's quite an amazing story how the cottage ended up in Fitzroy Gardens. In 1933, the owner of the cottage decided to sell it. However, the patriotic owner didn't want it to end up in American hands, so she made it a condition of sale that the building must remain in England. The forthcoming sale was featured in the Melbourne Herald, and got the attention of Mr. (later Sir) Russell Grimwade. Next year was Victoria's centenary, so he thought he should make a bid for the cottage and have it moved to Melbourne, as the capital of Victoria, whose coastline included Captain Cook's first Australian landfall. The owner was persuaded to change the wording of the condition of sale from "England" to "the Empire," and accepted the Australian offer of Â£800 vs. the highest local offer of Â£300. The structure was dismantled brick by brick, and shipped in 253 crates and 40 barrels, complete with a cutting from the ivy which had grown on the original building. Today the house is covered by the ivy. Near Cook's Cottage is Sinclair's Cottage, named after James Sinclair. Mr. Sinclair is pretty much responsible for the development of Fitzroy Square and Elms Avenue. Also within Fitzroy Gardens is the Conservatory. It opened on March 13, 1930, and has flower displays all year round, depending on which flowers are in season. Next on the agenda is the Yarra River Cruise, which I opted out of in favor of a walk along the river. One thing I noticed is that some of the bridges are built quite low. I wonder if the ferries can traverse them during high tide. After lunch, we went to the Rialto Towers to visit the Melbourne Observation Deck on level 55. Rialto Towers stands at 253 meters, has 63 storeys, and used to hold the title of tallest building in the Southern Hemisphere. That honour now goes to Eureka Tower, which is still under construction. Once completed, it will be 297 meters tall and have 92 storeys. Admission to the Observation Deck is $14, and includes entry to the RialtoVision Theatre, where one can watch the award-winning 20-minute film entitled "Melbourne the Living City," featuring the many attractions and events that Victoria offers. A high-speed lift (25kph) took us to level 55, which offers spectacular 360-degree views of Melbourne, 60 kms. to the horizon. We still have a bit of time to spare, so the tour guide took us to the Crown Casino. Comparing it to Sydney's Star City Casino, I'm quite impressed with the decorations and scale of Crown Casino. At the Atrium, Crown's light-and-sound Christmas Spectacular show happens every 30 minutes. As the giant clock counts down to showtime, the whole place is transformed into a giant circus with flying acrobats, dancing reindeers, plus the whirling carousel, the big top with the marionette show, and of course, Santa. Last on the list is the Penguin Parade at Philip Island. The tour guide stressed to us that the night is going to be very cold, so we spent some time first inside the Visitor Centre, watching some clips about the little penguins (Eudyptula minor), and observing them in their underground burrows. Just before showtime, we headed off along the boardwalks to the outdoor viewing stands. The place is just packed with people. There are rangers around who make sure you don't sit at the sides, and absolutely no photography allowed. I saw a few people trying to sneak some shots, and were promptly accosted by the rangers. I think they actually confiscate your camera, but I could be wrong. What happens is that the little penguins go out to sea fishing all day. At night, they swim back in and waddle to shore into their underground burrows to rest. Watching the penguins come in, you can see how evolution has influenced their behaviour. Once they get to the beach, they mill around and form a single file. Oftentimes, a wave would come crashing down on them, and they wash out to sea again. If they have the numbers and conditions are right, they make a run (more like a walk) for it. The others who are too slow fall back and wait until they get their numbers up again. Watching the penguins do this again and again is quite entertaining. At long last, I've finally finished all four books by Dan Brown. If you're totally new to the author, I suggest you read his books in the following order: Da Vinci Code, Angels and Demons, Digital Fortress, then Deception Point. No doubt Da Vinci Code is good - that's what got me hooked in the first place. Angels and Demons is almost a copy of the previous - same type of characters, same story development, but in a different setting. The plot's not too bad though. In Digital Fortress, Dan Brown tries his hand in the techno-thriller genre and fails miserably. In Deception Point, he goes for a political suspense, and again fails. Off to Melbourne for a 4-day tour. It's 880 kilometers from Sydney to Melbourne (or so I was told), so it's a great time to catch up on some reading. For the trip I brought Deception Point (just to get it over with) and The Princess Bride. You would think a guy can finish 2 books in 12 hours, but distractions abound. I look out the coach window from time to time, hoping for great pictures to take. Then, there's the pit stops every 2 hours or so. Other times the tour guide would put on a movie and leave the TV's volume on max. Not really conducive to reading books or listening to MP3s. During these times, I nod off to sleep. One of the stops we made is at Albury, the last town on NSW before we cross over to Victoria. According to our tour guide, Albury was originally selected to become the capital of Australia. On the day of site inspection, it rained and everything was dark and gloomy. That's how Canberra got the title instead. Yeah, blame it on the weather. 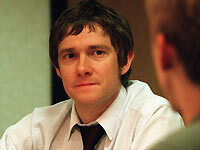 Why is it I feel I'm stuck in a world filled with characters from The Office, and I happen to be Tim Canterbury? I quote his character profile from the website: "Tim is a Sales Rep who is crushingly aware of the pointlessness of his work and the mediocrity that surrounds him. He is the classic under-achiever who rolled life's dice and got a three." Remember the scene where Gareth finds a gift-wrapped bottle of wine on the table, and he goes, "That's a bottle of wine." Tim gives a look of (mock) surprise, and asks, "You reckon?" And Gareth goes, "Yeah, just look at the shape." Spare me. To all the drivers out there. Always make the shoulder-check when changing lanes because blind spots really do exist, and they can be dangerous. Simply looking at the side mirror is not enough. I've been driving for years back in Manila, and I never got the habit to shoulder-check. I drive pretty fast, so there never was a need. Every time I switch lanes, I'm pretty sure noboby will be behind me. Here in Sydney, I have to keep within 60kph, and everyone else is on the same speed. Just a while ago, I had a near-collision. After making sure there was no car on my side mirror, I accelerated a little bit, and started turning the wheel. At the last moment, a white car magically appeared right beside me. I swerved back to my lane, and saved myself from car insurance hell. Obviously, the guy was not happy. I immediately gave him the universal peace sign between drivers, and he was appeased, I think. Passed by Burwood area, and noticed that Australia's one and only remaining Burger King outlet is no more. It has not been transformed into a Hungry Jack's. I covered this topic in a previous post. I was told that they are two separate companies; they just happen to have a very close relationship. Beats me, but their logos are suspiciously similar. Story goes that when Burger King first came to Australia, the name was already trademarked by a guy named Jack Crown. Hence, Burger King outlets were named Hungry Jack's. The only places where you can find Burger King outlets in Australia were in international airports, which are apparently not covered by the Crown licensing deal. As to how Burwood managed to have the last Burger King outlet, I don't know. But that's not important anymore. For those who never tried cherry-picking before, this is how it works. During cherry season (mid-November to late December), you go to a pick-your-own orchard. Some orchards charge an entrance fee, some don't. Obviously, the latter is better. Once within the orchards, any cherries you eat on-site is free-of-charge. (Remember to bring a high-capacity stomach.) You'll also be given a bucket. Any cherries you bring out of the orchard will have to be paid for (on a per-kilo basis). We went to Wombat Height Orchard in Young for our cherry-picking. The town of Young is in the south-west region of southern NSW. Took us 5 hours to reach there from Sydney by coach. The place is hot, dusty, and full of flies, but the cherries are not too bad. After 2.5 hours of cherry-picking, it's time to make the trip back home. Record-holder for the day is this Vietnamese guy with his wife and sister who picked 30+ kilos worth of cherries. What kind of gym opens at 9 in the morning and closes at 6pm during Fridays? That's my kind of gym. I never bothered to checked the hours of operation, and I found out the hard way. I guess the 5-minute walk back to the office is exercise enough. Hands-free kit - never leave the office without it. I was walking along George Street when the customer called. They attempted a WAP gateway cutover last night, but it didn't go too well, so they had to do a complete rollback. It's fingerpointing time, so they're wondering if I can join the teleconference. I would rather walk back to the office (which is 20 minutes away), and make the call, but they want to do it now, as in now. Thinking the sidewalk might be a bit noisy, I hopped into the World Square. It's not as quiet as I thought because the space is enclosed, and sounds from the shoppers echo. I hid behind an ATM machine. I took my position in a corner of the lifts section. The ambient noise was so bad the host asked the party responsible to mute his phone, which I promptly did. With my 6680 in mute mode, I can't use the speakerphone feature anymore. And this means I have to hold the phone to my ear for two whole hours, in case somebody asks a question directed at me. By the end of two hours, my mobile is noticeably warm, my ear is definitely hot, and I'm sure I killed a few million brain cells by cellphone radiation. I just finished watching part three of Adam Curtis' documentary called The Power of Nightmares on SBS. Its premise is that Al-Qaeda as an organized worldwide terrorist group as portrayed by the US and Britain doesn't exist. Yes, it's true that there are a few terrorist groups here and there doing their thing, but it's not the well-oiled terrorist group it's being made to be. So if there's no real Al-Qaeda, then who is Bush and Blair trying to catch all this time? Well, that's the problem. If your target is a ghost, it doesn't matter how many billions of dollars and troops you pour into Iraq and Afghanistan. There'll be no end to the witchhunt. The more important question is why. It all started with 9/11. We now know that 9/11 and Al-Qaeda and Saddam Hussein are all different things. We now know that there are no weapons of mass destruction (only weapons of mass distraction). The neoconservatives saw this as their chance to advance their cause, so Saddam was made the scapegoat. There he was happily terrorizing his own people, then the US troops moved in and bombed him out of his foxhole. When the US troops first went looking for Al-Qaeda in Afghanistan, things weren't going too well. The British offered to help with their years of experience fighting the IRA. Weeks later, still no Al-Qaeda in sight. So they enlisted the help of the local Northern Alliance. Better results this time. I mean, if you're going to offer x amount of dollars for every "Taliban" caught, of course you're gonna get results. I understand business was so good, the Northern Alliance was turning in anyone who looked remotely Middle Eastern. Hah! Later on, the Northern Alliance told the US that Mr. Bin Laden is holed up in the Tora Bora caves. Mr. Rumsfeld even went on national television showing blueprints of the sophisticated mountain complex complete with multiple levels, interconnected tunnels, computer and computer systems, bedroom and office areas, ventilation systems, etc. With this "intelligence", the US bombed the whole place, and the Northern Alliance went in. No mountain complex, no Al-Qaeda, except for a few caves used as arms storage. Feeling a bit out of luck, the neoconservatives took the search home. Wonder of wonders, everywhere they look there are terrorist sleeper cells. All of them Al-Qaeda! They said this man is a terrorist. Proof? He went to Disneyland with some friends, and he made a home video during the trip. They said he was casing the place for a possible terrorist attack. A trash can - that's where he plans to plant the bomb. A shot of the ground - he's counting the steps. Oh, a tree - that's where he intends to hide in a sniper operation. Another man was arrested as a possible terrorist. He had some doodles in his planner. An expert was called in and she testified that the doodles represent a military base in Turkey with AWACS planes and fighter jets on the runway. It was later proven that the man who drew the doodles is a 100% lunatic. I guess that makes the "expert" a lunatic, too. Heard about the one about Ultimate Jihad Challenge? Supposedly a school in London for terrorist training? Turns out it was a self-defense course. The school's only client is a security guard from a supermarket. Then there's this bunch of students playing paintball in Virginia. They were convicted of training to make a terrorist attack. The stories are quite funny, until you realize they're all true. But don't take my word for it. Watch the series, or read the transcripts. Spread the word. Peace, man. It's two in the morning. Do you know where you are? Well, I'm at the customer data centre, sshing to a traffic analyzer, and updating some charging rules via a Java applet. I'm thinking what am I doing here? This is not my activity; I'm not being paid overtime; I'm not even supposed to be awake at this time of the morning. The customer is supposed to do it by themselves, but somehow they feel better with me on the conference bridge. Start of activity, my counterpart discovers the Java on his remote desktop is not working properly. He continues with it anyway, and messes up the rulebase. I tried to connect to the box via DSL through a VPN tunnel. Curious enough, the Java on our remote desktop in Europe isn't working, too. We got an Ops guy to try on his desktop. Fortunately his works, so we got him to make all the rule modifications for us. For verification, he emails us all a screenshot of the completed rulebase. A closer look at the status line shows that there's a problem with https, so the rules were not actually saved. By now, my counterpart is not amused. He wakes up the IT guy and made him install a new version of Java on the remote desktop. Didn't work as now there's a version conflict. The IT guy says he'll look into it next morning. My counterpart smells blood and that's what he wants. He rings up the guy's supervisor. Remember this is around 1 am. The lady supervisor joins the bridge and she has no idea what is going on. I've been on the bridge for like 2 hours already, and I wonder what my monthly mobile bill is gonna be like. I just want to go to bed, so I offered to drive down to the data center and fix everything up. Five minutes after I arrive, another guy drove in. Ah, it's the IT guy. Apparently, some things can't wait till morning. He got off the correct Java version from me, installed it on the server, and left. I fixed up the rulebase, and dialed back into the bridge. My counterpart is not there. Nor is he answering his 3G phone or his XDA. Jeez! The guy dropped off to sleep again! Gosh, I love my work. We had a summer picnic with some friends and acquaintances at the Berry Reserve in Narrabeen. Great place for fishing, kayaking, and reading a book (which I did). I would've joined the 1-hour kayaking activity had I bought a change of clothes. After a potluck lunch, we played a round of charades using movie titles as the category. After 16 or so rounds, our team won hands-down. I mean, with movie titles such as Ishtar, Amadeus, Donnie Darko, Bill and Ted's Bogus Journey, The Librarian: Quest for the Spear, The Incredibly True Adventure of Two Girls in Love, Boxing Helena, etc., there's just no way we're gonna lose. After a months-long hiatus, I'm back to my badminton habit. I have to say they have nice courts over at the Athletic Centre of Olympic Park. I played a mere two games, and I'm hurting all over. I must be working the wrong muscle groups at the gym. I skipped last year's Christmas Party at Aqua Luna Bar, Circular Quay. People tell me it's a wise decision because it's all cocktails and no food. Everybody sort of just milled around and made small talk throughout the night and that's it. This year, we had it at Stage 11 Fox Studios. There was a line-up of show to liven things up. We had a fashion show and awards ceremony for all the guys who signed up for Movember to raise funds and awareness for prostrate cancer research. We had 10 or so Mo Bros, who raised approximately A$6,000. HR got this neat idea to sponsor one of our colleagues who has had a permanent beard since the 70's. In a matter of minutes, after auctioning off a few bottles of wine, and with our manager doing the rounds with a donation box, another A$2,000 was raised for the Prostrate Cancer Foundation of Australia. The guy was called on stage and was given a shave right then and there by a barber. Next up, another colleague performed a sizzling Seda dance. After some intense gyrations, the piece of cloth covering her ample chest can't take it anymore, and started slipping off. So she had to dance with one hand holding on to it. Next, her black skirt had a 'wardrobe malfunction', so she had to hold on to that, too. The dance wasn't that much fun anymore from that point on, and she made a hasty retreat after the song ended. Last act is a rock band made up of engineers. These are the guys I work with day in and day out. Quite amazing to see them on stage singing and playing like rock stars with a bad attitude. The lead singer is a Finn, keyboard is from Czech Republic, drums from Finland, and guitars/bass from India, Thailand, and Italy. You can't get more international than that! They played a succession of nine rock classics - they kind where you bodyslam, headbang, and jump up and down to. Smashing! I left the place relatively early around 10:30pm. Was already at the carpark when I remembered a colleague of mine who came via taxi. Good thing I called because she was planning to take the bus to Town Hall, then to Pyrmont. And the first bus is only coming at 11:30pm. Chalk up 10 karma points for me for giving my colleague a lift home. Can't believe it's December already. About a month ago, Sydney weather hit a high of 38 degrees - the highest on record. And that was spring season. We're now moving into the summer months, and it's been raining almost every day with temperature in the low 20s. The weather shift can be quite fast. Within the same day, it can go from showers and thunderstorms to mostly sunny and hot. Kyoto Now!